The What: TRENDnet recently announced the launch of its PoE+ AV Series Switch line. The new line of PoE+ AV switches is designed with a clutter-free front panel display, with no cables in the front, for convenient integration into existing AV equipment racks. The What Else: TRENDnet’s high-power AV switches allow users to manage their audio visual network at work and at home. The AV switches feature front-facing LEDs that convey PoE power total, total PoE power remaining, and PoE power consumption per port. Rear panel ports improve cable management and provide easier accessibility to other AV equipment. TRENDnet PoE+ AV switches are suitable for a variety of uses including in restaurants and bars with several TVs and monitors, large homes with a multi-room AV setup, and as part of a surveillance solution with an NVR. 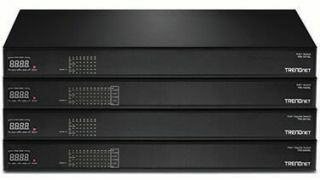 The new line features multiple models to fit varying needs, including an entry level model for basic AV setups as well as models equipped for long distance fiber optics networking. TRENDnet’s 16-port 10/100 Mbps PoE+ AV Switch, model TPE-1016L, is an entry level model featuring 16 fast Ethernet PoE+ ports with a 250 Watts total power budget. The fan-less design allows for installation in quieter environments. TRENDnet also offers a higher performing model with the 16-Port Gigabit PoE+ AV Switch, model TPE-3016L. For long distance fiber optics networking, TRENDnet currently offers two models. TRENDnet’s 26-Port 10/100 Mbps PoE+ AV Switch, model TPE-1026L, features 24 fast Ethernet PoE+ ports, two shared SFP slots, and a 430 Watts total power budget. TRENDnet’s 26-Port Gigabit PoE+ AV Switch, model TPE-3026L, features fiber optics networking at gigabit speeds. The Bottom Line: TRENDnet’s AV Series Switches are now available worldwide through major retailers and authorized TRENDnet partners.